Over the past two weeks we have been considering the user experience of a range of websites, in terms of experimenting with text/data mining and understanding ‘mark-up’ languages. These websites have included The Old Bailey Online, The Utrecht Digital Humanities Lab research projects and Artists Books Online. The Old Bailey Proceedings Online (OBO) is a fully searchable, digitised collection of all existing OBO editions from 1674 to 1913. 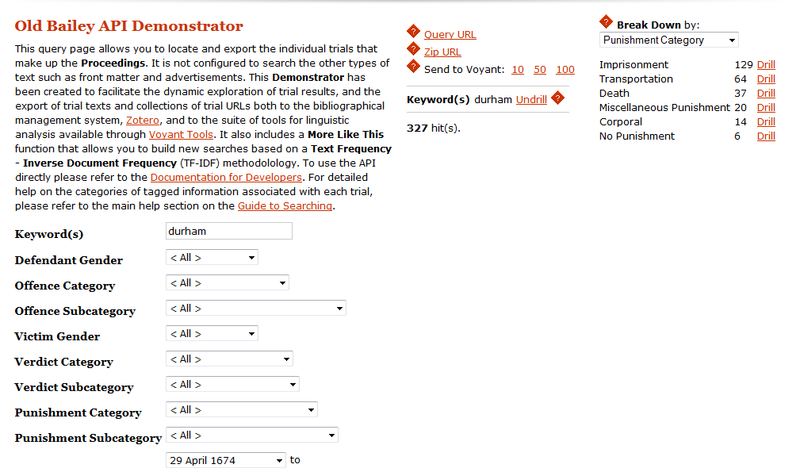 There is access to over 197,000 trials and biographical details which are free of charge for non-commercial use. In addition to the text, the website holds digital images of all original pages alongside contemporary pictures and maps. It has advice on methods for searching and holds historical and legal background information. The OBO has a very friendly interface. It offers a wide range of search pathways from it’s search home page. It’s worth exploring the list and understanding the detail of the documents and associated records as this has a direct impact on what you are attempting to seek. ‘Digging away’ recently has been a fascinating experience. 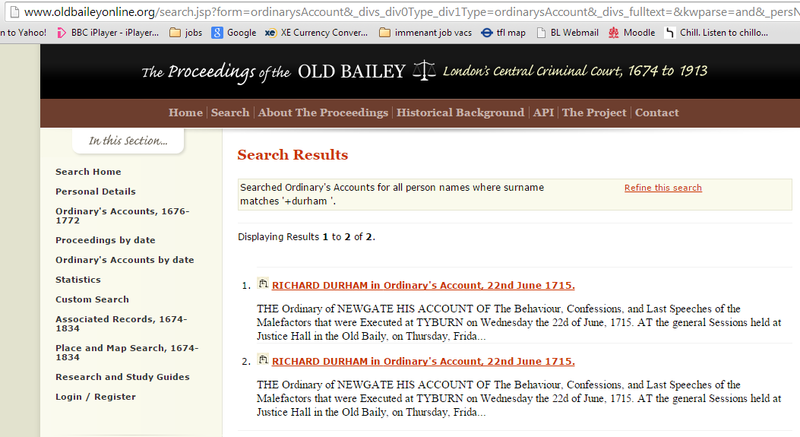 I couldn’t resist looking for criminal shenanigans under my own family name (‘Durham’) as ‘Surname’ was available as a category on the main search page. With a result of 156 hits, I then narrowed things down under the drop down ‘punishment’ category to the macabre ‘death sentence.’ Five separate cases stared back at me, the reading of which was pretty tragic. Delving further, the historical background home page explained that in many cases, death sentences were not carried out and that only the Ordinary’s Accounts reveal actual executions at Tyburn. The surname search for these accounts show only one execution for the era. Opening this link shows the account of the clergy in supporting the condemned. Scans of the original can be viewed and at the bottom is the option to view the text in eXtensible Mark-up Language (XML). ‘Mark-up’ is a way to add levels of machine meaningful, searchable structure to data in a document, in the form of tags that bracket words or phrases. They are embedded in the text, follow a hierarchical structure and are common to digitised forms of documents, to aid discoverability and comparison of content. Naturally, consistency in ‘mark-up’ language approach is key and Charles Goldfarb’s ‘Standard Generalised Mark-up Language’ (SGML), dating from the 1970’s, is still the guideline of choice. And from which the Web’s own basic HTML has descended. 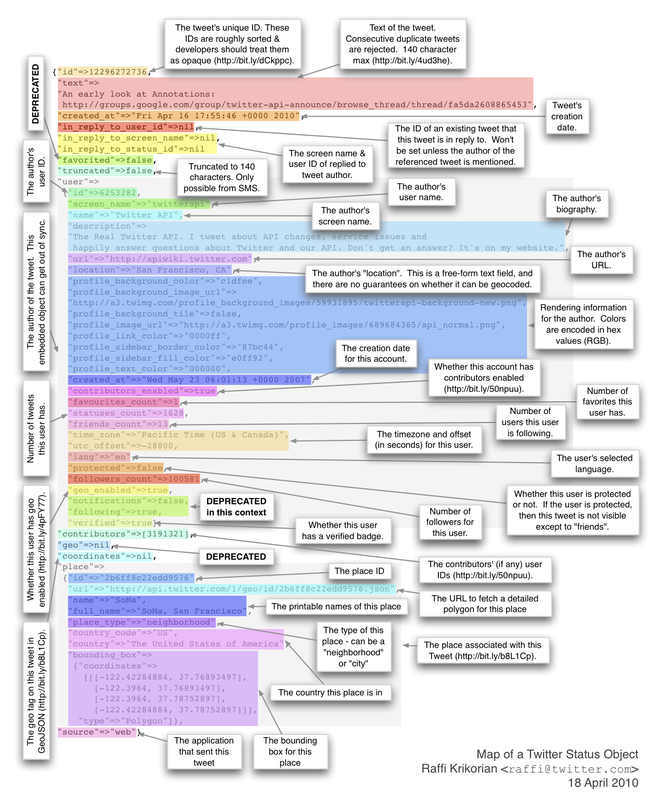 XML is ‘a bundle of SGML conformant rules for making up elements and specifying their content models’ which are simple and work easily with the web. 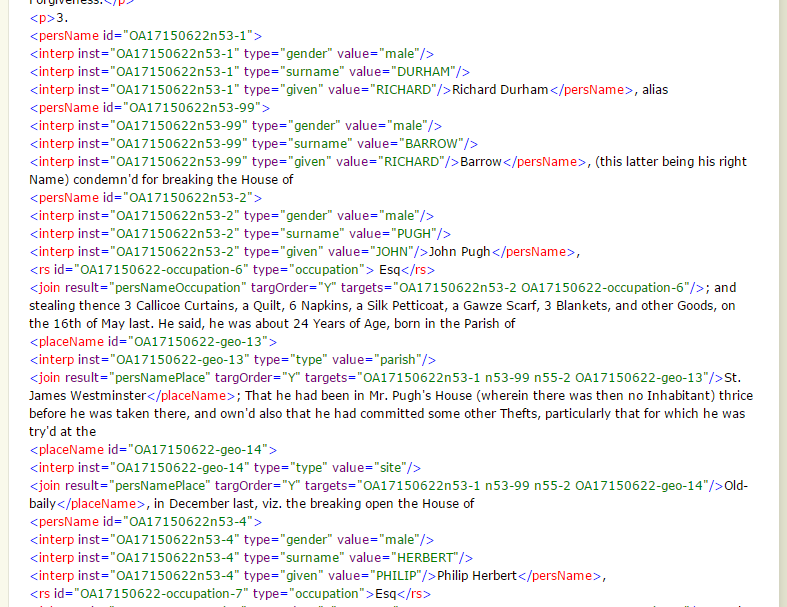 For the OBO, the digitised text was marked up in XML in order to facilitate this structured searching and the generation of statistics. 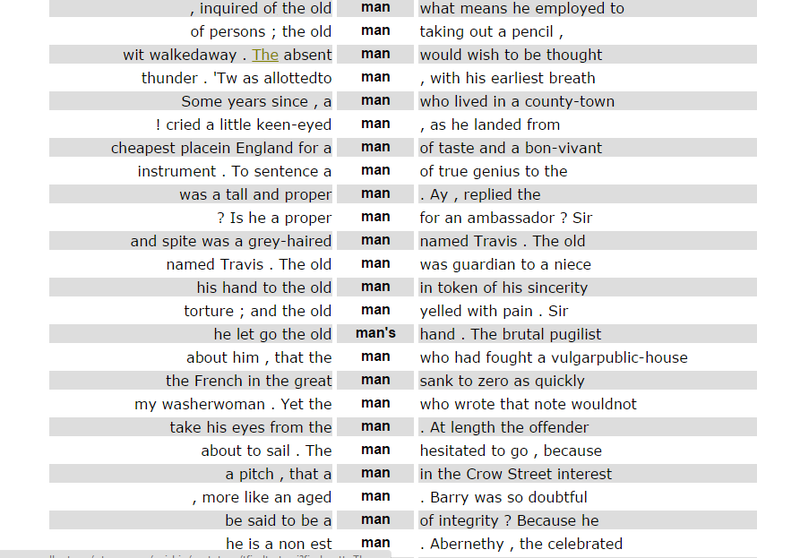 The About page tells us that ‘Trials tend to have a regular structure (though with considerable minor variations) and certain aspects of the text were tagged to reflect the meaning of particular words or phrases, for example names and crimes.’ The list of mark-up catagories can also be viewed on the link. 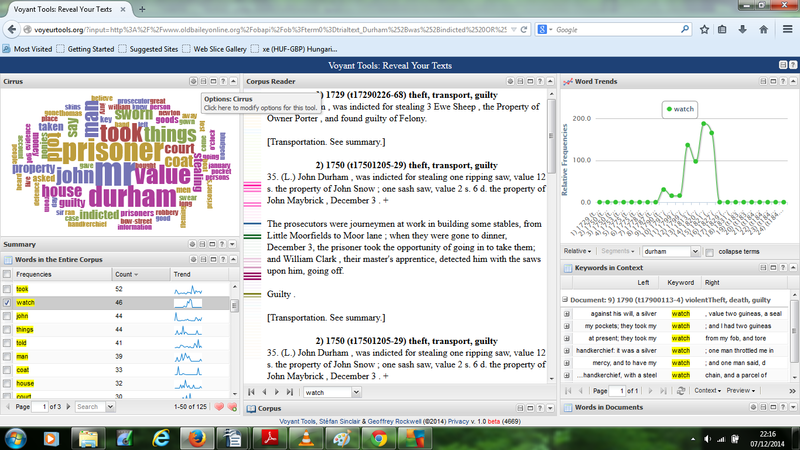 I then wondered about how to investigate, export and analyse the text for 156 hits, to find further lines of enquiry regarding the kind of offences and punishments related to ‘Durham.’ OBO also has an API which allows a search by ‘trial’ and it allows you to explore the result sets, before exporting to Zotero, or to Voyant for further text analysis. It also provides for ‘drilling’ and ‘undrilling’ of subsets of catagories. 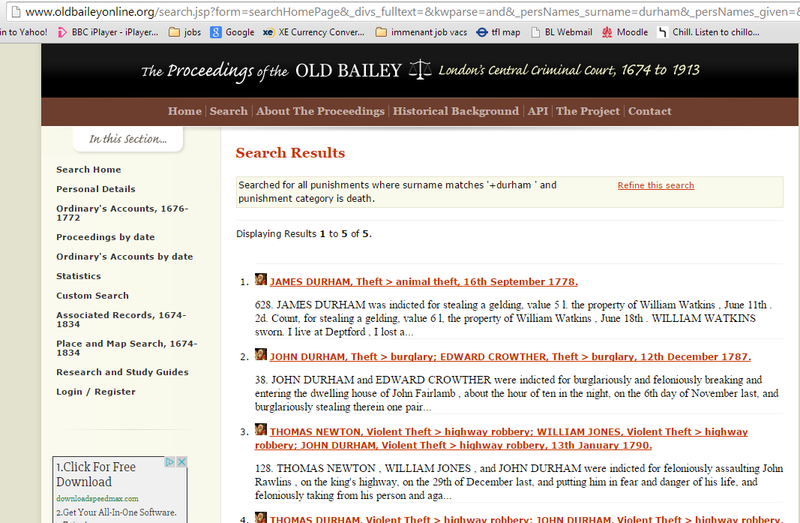 As there was no surname catagory, the keyword seemed to be the logical choice, although this would generate anomalies as a term now unattached to ‘Surname.’ Drilling the resulting 327 gave me some feedback but many trials that I opened from the lists were unassociated with Durham as the defendant. Using the common text from the opening sentences of the trials helped refine my requirement further as I tried the following string, ‘Durham+was+indicted OR Durham+were+indicted.’ And a more focussed 24 trials appeared. So on to exporting to Voyant – a small selection like this wasn’t a problem, although I know there have been problems during the labs sessions due to high useage. The research project ‘Criminal Intent’ originally mentioned that although Voyant tools are capable of a lot, ‘there are limitations and bugs. Although the underlying system has been designed to support large-scale text analysis, the current server infrastructure has performance and reliability issues.’ The project actively welcomes feedback from users in order to improve. The last time I trawled the scholarly ‘sea’ for relevant, quality research was when I was studying for my Postgraduate Diploma/MEd around 5 years ago. Back then, citation and impact factor, government papers and contemporary, trending theorists and topics were the way to navigate, assess the waves and hopefully make a good catch. Altmetrics.com present a very user friendly ‘Explorer’ interface for search and analysis using the Altmetrics API (also available for scholars/developers), a bookmarklet that you can drag to your search engine task bar that will report on attention received by research you visit online and embeddable ‘donut’ or label badges to denote online impact on users’ article pages. The two previous highlighted links also provide simple overviews as does the embed below. 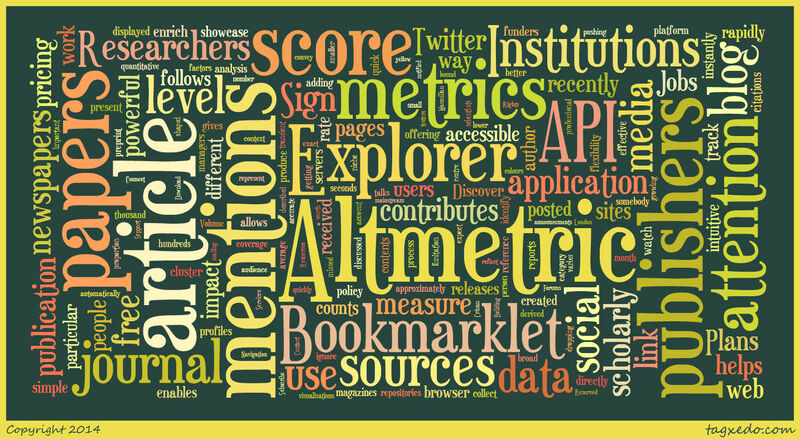 The evolving field of altmetrics provides article-level data. This is in contrast to the traditional bibliometric, journal level, citation method which has received criticism for it’s quantitative bias that can be slow to reveal impact and open to manipulation. 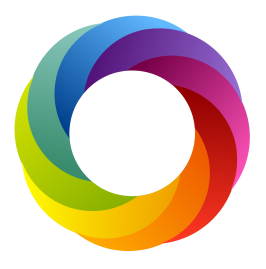 As the altmetrics method uses a range of data sources, it is suggested that it can provide qualitative as well as quantitative information, and aspires to give a finer tuned picture of an article’s influence. It also has possible advantages of constructing that picture at a much greater speed than that of academic publishing. However, as altmetrics are still in their infancy, there is not as yet a shared view on what choices, analysis or data combinations are a reliable indicator of influence. In addition, there is debate on the correct conduct within and across Twitter, blogs and other social media sources. Altmetrics.com comment themselves in their blog that , ‘Each altmetrics tool will have its own way of handling suspicious activity,’ and that they use ‘a combination of automatic systems and manual curation,‘ that does take much time and effort and so the company also requests that users aid monitoring and report anything unusual. In terms of addressing scholarly consistency and widening access and impact to research, Ernesto Priego comments on the need for curating and maintaining an academic audience on Twitter, so that a tweeted article is propelled to an optimum reach. 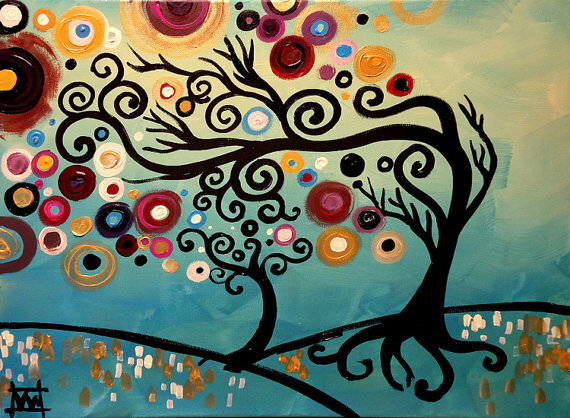 A ‘yin yang’ synergy of qualitative and quantitative methods is also argued for, with one informing and the other tempering, culminating in a fair and hopefully trustworthy measure. 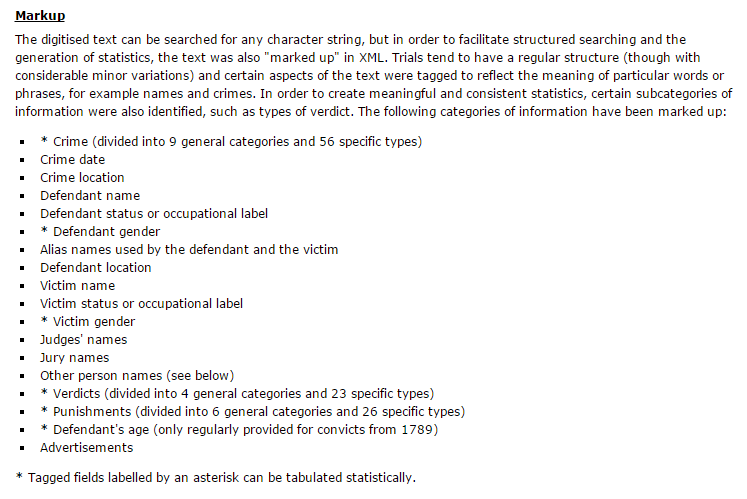 Metadata is data about data, ‘meta’ meaning “an underlying definition or description.” According to Chowdhury and Chowdhury, 2007, metadata, ‘describes the various attributes of a resource that are deemed useful to access, retrieve and manage it’ and facilitates ‘its discovery, use, sharing and re-use.’ After all, what is the value of a resource that no-one can find and particularly in the 21st century, that no dynamic computer program or search can harness. 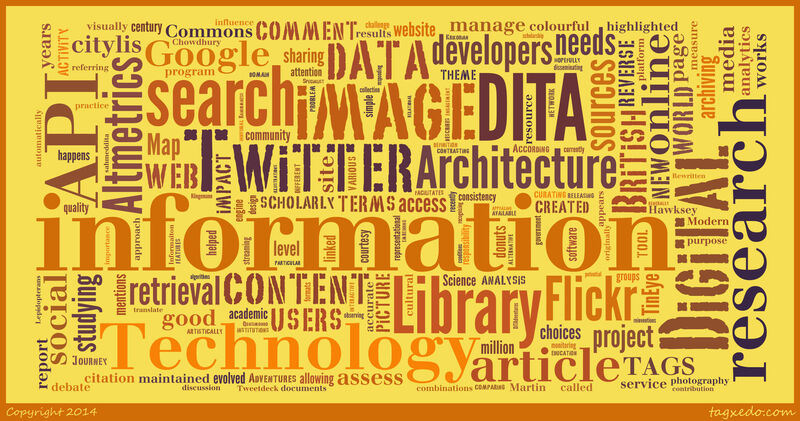 Regarding our modern, interactive Web 2.0 world, our studies this week asked us to consider the use of social media as a method of research, in particular a focus on Twitter coupled with an archiving and data visualisation tool called TAGS (Twitter Archiving Google Sheet). TAGS has been developed by Martin Hawksey over the last few years and is a mash-up of the Google Docs and Twitter API, designed for ease of use, originally to automatically monitor tweets at event Twitter hashtags. Once the analysis tool is used, hashtag data results are interpreted visually in a number of ways alongside the data spreadsheet. So what’s in a tweet? With an estimated 400 million tweets a day there is alot of data! And in order to manage that data for researchers, there are in fact 3 different types of Twitter API allowing different sampling under different terms. And just like tweets, similarly, across API-linked network giants, the analytical unpacking, mixing, reboxing and display of metadata continues, feeding the marketing and entrepreneurial needs of business and the scholarly needs of our own academic and cultural pursuits. But a word of caution.. In addition, a viewpoint from Alistair Brown, LSE blog states that as Twitter data from the free streaming API is limited to a seven day provision, ‘one problem with Twitter is that it does not maintain an easily searchable archive of tweets, meaning that any engagement activity may be lost if not captured more or less as it happens.’ Brown goes on to report that analytics software struggled to produce consistent search results in his experience and that truer representations were accessible whilst employing a platform such as ‘Tweetdeck’ where specific searches can be added as columns and observed in real time. And finally, a 2013 study by Morestatter et. al, can be seen here. comparing and contrasting the 7 day streaming API and the ‘Twitter Firehose’ which, although allowing full access to the leviathan of all real time public tweet data, is a very costly approach and a difficult challenge to facilitate.